So, our game Project Libra has a main character… as most games do. However, I did take some time before I started tackling his whole deal. We had a little bit of an identity crisis for Ace, our rookie defense attorney. And, I mean, it’s a fair thing to have when your main character’s name is, somehow, part of your main inspiration game series’ name. Doubly so when your main character has the same role and attitude as that same game series’ main character: they’re both rookie attorneys, designed to react in ways someone who has no court experience would react in court. So it’s a little complicated. Not to mention, I’m not very good at drawing men that look like men in the slightest. Men can be feminine, but it’d be nice to know how to draw masculine people sometimes. Only sometime. Ace doesn’t even have a confirmed name yet. Right now, he is Alice “Ace” King, the rookie defense attorney. He’s a 22-ish years old man who got out of law school recently and has been working with defendants of murder cases at Drake Law Offices. But this doesn’t tell me much about his style. And his style is shifting a little. As for his life story, he grew up a single kid with boundless curiosity at his disposal. As a kid, he was a fan of detective stories, good in class and a bit stuck up. As an adult, he’s devoted to his causes, but a bit clueless on how to step forward and doesn’t like the spotlight too much. He has somewhat of a shell to grow out of. He also dislikes his name, Alice, so he insists on going by Ace. Beb wanted his characters to be buff, like how Phoenix and the others are in the Ace Attorney series, however, Ace himself has a bit of a clueless attitude. It was made to match how the player themselves would likely feel in their first court cases. Moreover, in the course of our story, some of Ace’s character development and coping mechanism result in him being sensitive and timid. Not to say a big buff man can’t be timid and sensitive, just that it’s a bit more difficult mix to draw and portray nicely. Especially for me, who doesn’t draw men very often in the first place. So, yeah. Ace. I’ve yet to be comfortable drawing him, which is problematic right now as he is the main character. It’d help if he had a definitive last name, which, as of right now, is King, but I’m lukewarm to this name. Ace King… Alice King…… it’s a little corny. 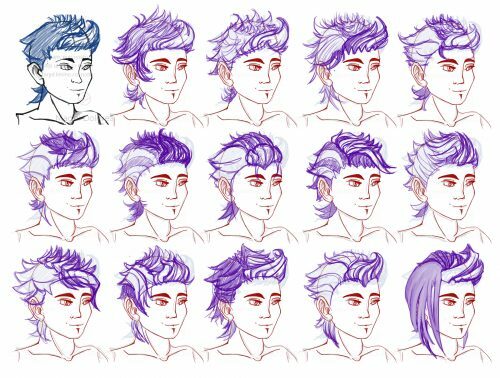 To help figuring out how he is, I decided to draw as much men styles as I could, as perhaps one of them would jump out and reveal itself as being Right. At first, I was doing pretty much… whatever. I did this and thought it looked nice on the moment, but then I hated it. Which also sort of made me uncomfortable. Why is his head so big? I guess this works on women… Drawing men is hard. So, I figured I needed a structured approach to Ace. First, the best part: hair. No matter what I chose for his hair, it wouldn’t affect how his body looked, but it would define his identity, so this was the easiest part to start with. 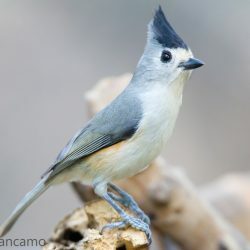 I wanted Ace to look like the Crested Titmouse bird, as we assigned cool birds to all our main characters, but he also had to not look like Phoenix Wright, which is itself a challenge of its own, since the bird has the same spikey hair as he does. I mean, the resemblance is uncanny. In there, there were some hairstyles that were cool enough for the both of us. However, they were all edging to the spiky side of things, and reminiscent of Phoenix Wright still. So, I decided to split the hair in different parts and then try different styles with them. I thought, hey, maybe he’ll have a spiky back like phoenix, but at least the whole front side could be different! Top left was the hairtstyle I started with, then I just tried to do some variations. Plus, it made me practice more hairstyles. These are always nice to draw. Some time passed between the hair ordeal and now. I just did some testing for the poses recently, and the hair stuff happened in November, I think. I have tweets about it I could verify… but I’m lazy right now. Anyway, I had a bit of time between here and there, enough so I could forget Ace’s hairstyle. Not great. But it didn’t stop me, because the next step is drawing down the poses he has in court. Ace is one lucky character because he is only seen in court, since he’s the player’s “camera” point-of-view the rest of the time. This means he has less sprites I have to draw! Woo!! These exercises were to know where I wanted to go with each of the poses Ace has in court. 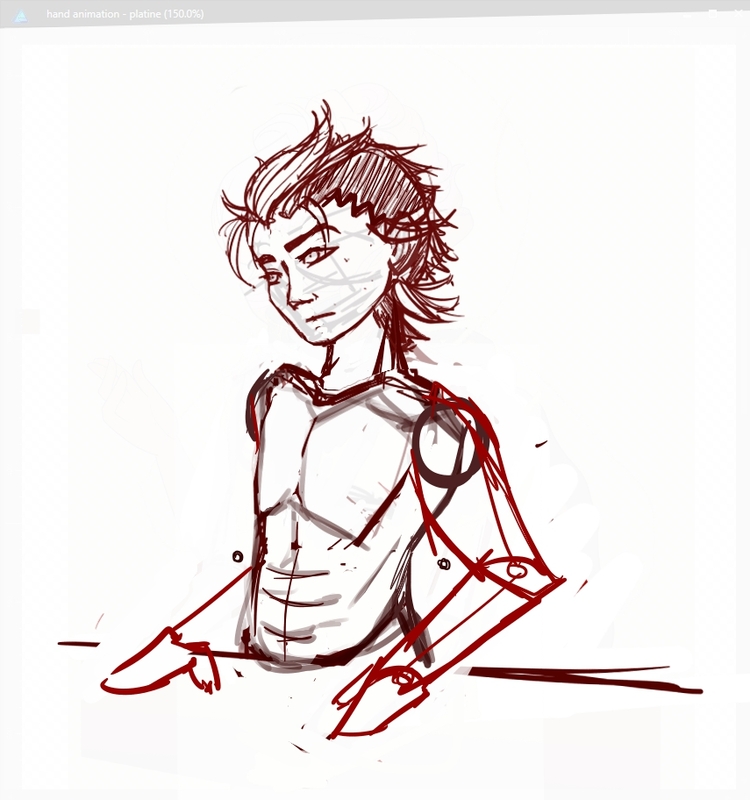 They are sketchy now, but I’ll redo them better when I have a better grasp on his body. At least the poses I laid down so far are dynamic and nice-looking. 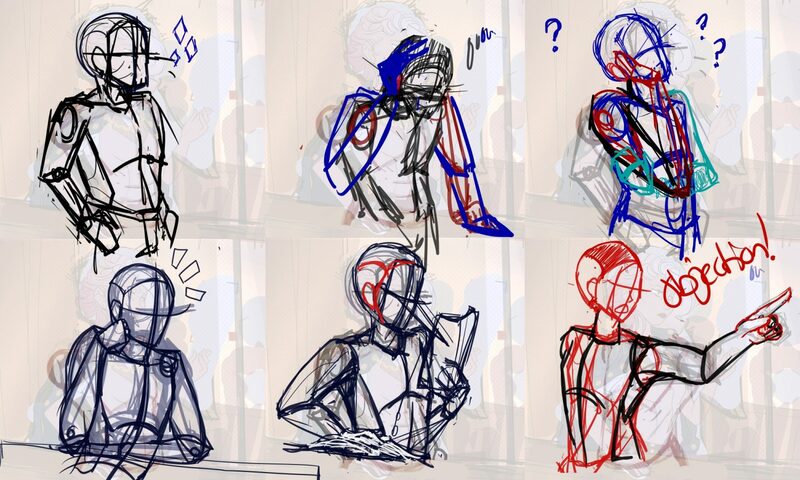 There’s a couple I didn’t really like and may need to redo, like the Objection pose (the pointy one) or the Snarky one (the one there he holds his head with his fist). Next, I wanted to try to do a 180 degree reference sheet for Ace. I didn’t need to sleep on it to notice something was wrong with his body, he felt too small or frail to what I was trying to do. Clearly, I was leaning on my habit to draw women, so I tried again with a lifeless figure… then I thought, maybe he only needs some clothes and a face to look a bit more manly? 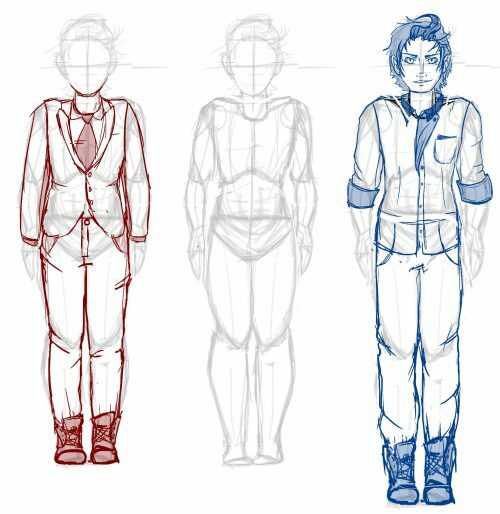 The first one on the left uses the same proportions as my original reference sheet test, and the one on the right tries to be a bit taller, to see if it fixed him. 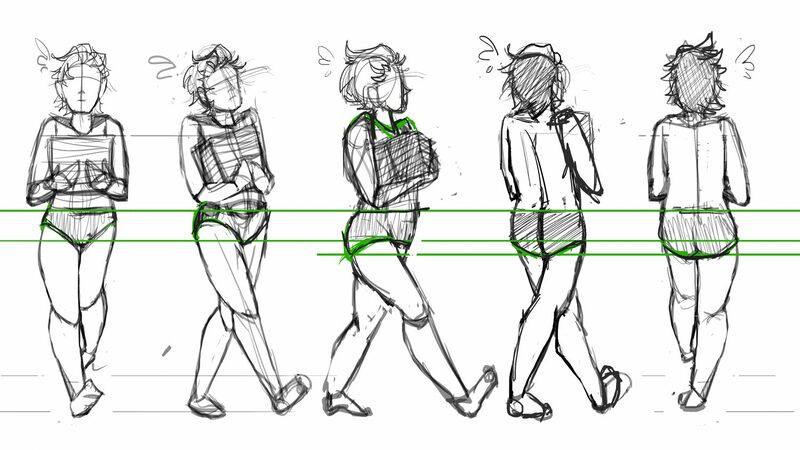 I think it made it a little better, but my goal was to keep the bodies proportioned a bit like real life, where bodies varies from being 5 to 7 heads tall. But the one on the right is 8 heads tall, and Ace is far from being the tallest character we’ll have… I fear I won’t have a choice than just make everyone super long for some reasons. I still have some work to do ahaha. Anyway, even then, I still felt Ace was a bit shrunk. I noticed the shoulders, even though I tried my best to widen them, still felt too together. I knew I had to practice drawing men a lot more, and from reference, instead of trying to construct them based on my experience of drawing women. To help with drawing men, I decided to trace men in animes I enjoy, notably Castlevania and Persona. What I did mostly was practice drawing the men of those series and deconstruct their bodies to see how each part relates to the others in size and distance, and so on. The goal of this process is to force feed my brain into seeing these relationships between shapes in men’s form, so I can bring them over when I do original art. Now, I haven’t done any original art for Project Libra with those new abilities yet. 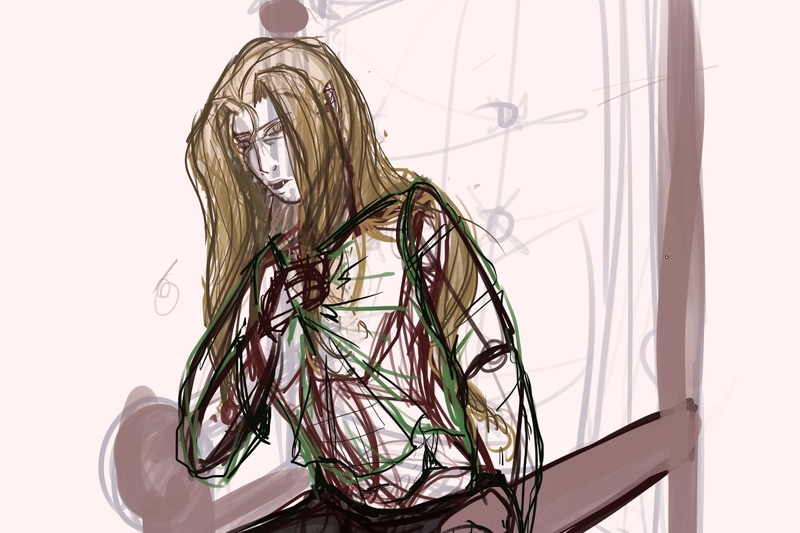 I pretty much only sketched Alucard, from the Castlevania anime. Additionally, last Tuesday, I went to see the Lego 2 Movie in theaters, and I had the best idea ever for an art piece. It only makes sense in this extremely niche diagram where you know about Castlevania, Land of the Lustrous and have seen Edward Cullen (Yes, from Twilight) in the Lego 2 movie, sooo don’t worry if you don’t get it. Again… without the context of those things, the link can be unclear. But, trust me, it’s going to be awesome. 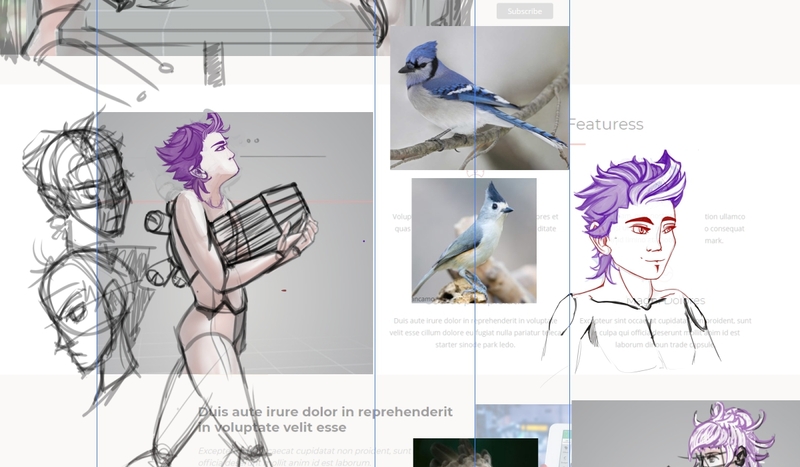 At least I did try to apply what I learned so far and I find this manly form quite nice, for a change. 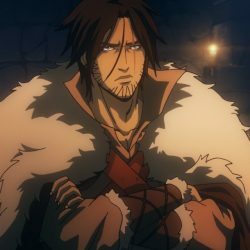 Even though Alucard has a strong feminine side and this is still quite a comfortable zone for me, I find the face quite convincingly manly. PS: I know the hips are intense. Notably, I didn’t really use the Ace Attorney series as an inspiration or base to try to follow, because I don’t really like their perspective or proportions… However, since we’re going for the same dramatic pointing “Objection” in court, I may have to reconsider and do it anyway. 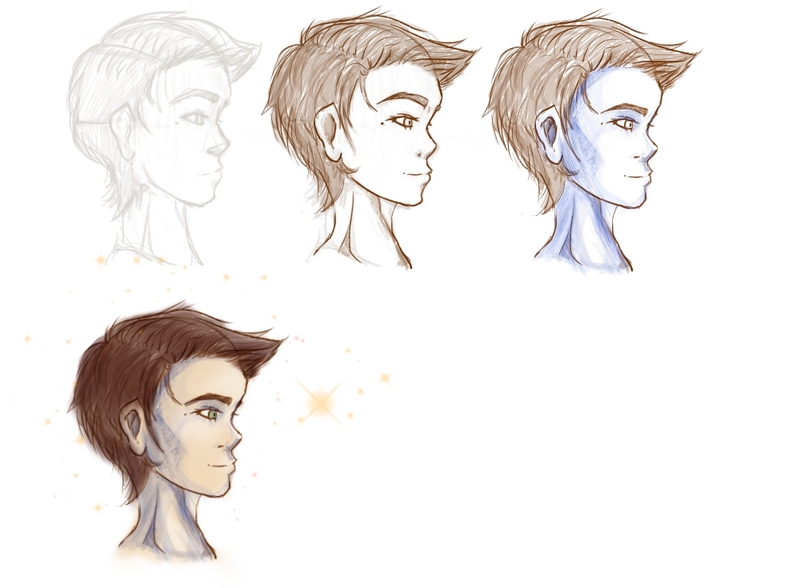 Now, I just need to apply what I learned on my next drawings of Ace, consistently. 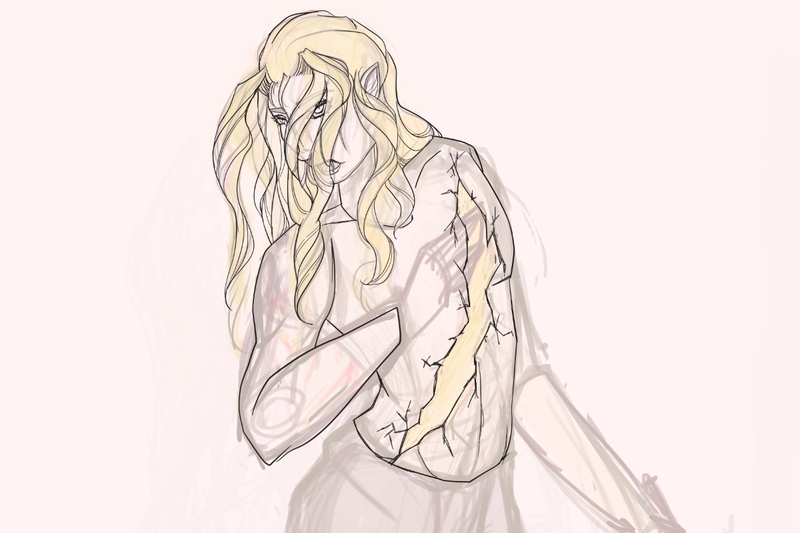 Moreover, there are a few things I still need to iron out with him: even though I’m on the right track with how he looks, I still have to get comfortable and more fluid with him in my drawings. Right now, the men I draw are still a bit stiff, and especially so for him as I don’t have the best grasp on who he is. I still kind of treat him as a careful but clueless kid, even though this runs against how we want to have him portrayed in the game. So, next up, I’ll need to loosen up when I draw him and find out how he presents himself to us and make him look more natural. There’s a lot of practice for me in the horizon. If you like this kind of content and would like to know more about our game Project Libra, check out the page we created for it over here. Subscribe to get updates like this as soon as they’re live!